I found this really interesting side table the other day. I've never seen anything like it before. It's just a pretty basic box table, but what I found interesting is that it has three drawers that all open in different directions. I thought it would be a fun table to paint. The drawers don't have handles and are pretty discreet so I thought I would keep that feel by painting it all one color. I picked a chocolate brown. I thought I'd add to the feeling of the drawers being invisible by creating a pattern that stretched across the drawer front and up the sides. I went with white vinyl branches. I thought it would give it kind of an asian feel that would match the style pretty well. I placed the sticker across the drawers and then cut the seems with razor blade. You could also use a stencil to create the same look. It turned out just how I had pictured it in my mind. I love it when a plan comes together! 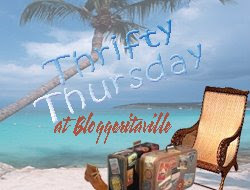 If you'd like to link to Thrifty Thursday go HERE. I love it! It is such a fun and unique piece. How gorgeous! That turned out great! Love the table and really love the 3 drawers! It looks great! What kind of paint do you use to paint over wood that has already been painted and sealed? Is there a special kind? LOVE the table...it looks great! I was also looking at your redo of the kids bathroom and you gave me a great idea. There's never enough room to hang up all the towels, and I've tried hooks on the door, but the kids can't reach them and it's ruining the door frame. Never thought of just doing something on the wall INSTEAD of the rod...Thanks! I lo-o-ove it! (said in a sing-songy voice.) It looks amazing! What an intersting find! And I love the facelift! Its very sheek. LOve the chocolate color. Very cool find! Thanks for playing Thrifty Thursday!